What little boy or girl doesn’t love sticking their hands in something colorful and messy in the name of art?! Unleash their inner artist with these fun ideas for Christmas Handprint and Footprint Crafts. My favorite is the Holiday Handprint Charms; I can’t wait to pick up some Shrinky Dinks! There are plenty of cute ornament ideas too, like the Handprint Snowmen, Baby Footprint, Salt Dough Santa Hand, and Reindeer Christmas Cards and Ornaments. The kids will love helping you create homemade decorations for your Christmas party with these ideas: Painted Placemat Table Runner, Thumbprint Christmas Lights, Footprint Penguins, Christmas Footprint Art, Snowman Feet, and Footprint Sleigh and Thumbprint Santa Christmas Scenes. Your next Christmas party will be a huge hit with these 16 Cute Christmas Party Food Ideas Kids will Love. If your family does Elf on the Shelf, you will want to get these Elf on the Shelf letters and templates. SO CUTE. Check out these Free Printable Christmas Games you can play at your next holiday party! Get busy creating with these 12 Christmas Ornaments Made with LEGO. Say “goodbye Elf” with this fun and creative ideas! And I think these would be especially good for a Christmas party activity: Christmas Handprint Reindeer, Easy Christmas Craft Ideas for Kindergarten, Reindeer Footprints, Handprint Angel, Grinch Handprint, and Handprint Candy Cane Craft. Fun for kids and easy for adults to pull together, this handprint reindeer craft is the perfect choice for Christmas! Plus, the supplies can easily be found at the dollar store. Handprint and footprint crafts definitely carry sentimental value! This painted placemat table runner incorporates both and is the perfect gift for parents and grandparents. Snowman feet and handprint trees? Adorable! If you need a quick and personalized gift for a loved one, this handprint snowmen ornament idea is adorable! It’s definitely a keepsake! There is nothing quite like a baby’s first Christmas! This baby footprint ornament made from clay, celebrates that special first year and is a great gift for special relatives. A child’s foot, a little brown paint, some google eyes and a red pom pom nose later and you’ve got yourself one darling reindeer footprint! Cut them out and turn them into awesome gift tags! No need to spend a lot to have a meaningful gift! These reindeer Christmas cards and ornaments are big on heart, but low on spending! Relatively mess-free, this handprint angel craft doesn’t require paint! Simply trace your child’s hands on paper prior to cutting them out, and add some additional paper details, as well as a hand-drawn face. These holiday handprint charms use Shrink Plastic and are easy to create with just a few supplies. They make perfect ornaments for decorating your tree and also work as charms for necklaces and key chains! Go green for this Grinch handprint craft! Coat your child’s hand with green paint and stamp it on paper before adding in some Grinch face details with markers! No electricity is required for these Christmas lights, just some paint, thumbprints and paper! Kids will love dipping their thumb in a variety of paint colors to create a festive strand of Christmas lights! If the shape of these adorable penguins looks familiar, you probably realized they are made from children’s footprints! This is such a great and inexpensive craft to do and makes a great gift! Add some Christmas footprint art to your holiday décor this year! A white footprint can easily be transformed into a snowman for a nice wintry scene. Candy canes mean sticky handprints! What better way to decorate a plain white candy cane than with red handprint stripes? A painted handprint with penned details can create a whole family of adorable snowmen! Make the perfect winter artwork by creating snowmen from painted footprints on canvas! Add cute paper or washi tape scarves for some extra cute details! Create the perfect Christmas Eve scene for Santa with a painted footprint sleigh and the cutest thumbprint reindeer! One thing is for sure, Santa looks good made into a salt dough ornament! This cute idea proves that! Children will love transforming their handprint into a cute Santa ornament to hang on their tree! These little handprint snowman ornaments are made on mini canvases and are the most adorable, sentimental works of art perfect for hanging on your tree! 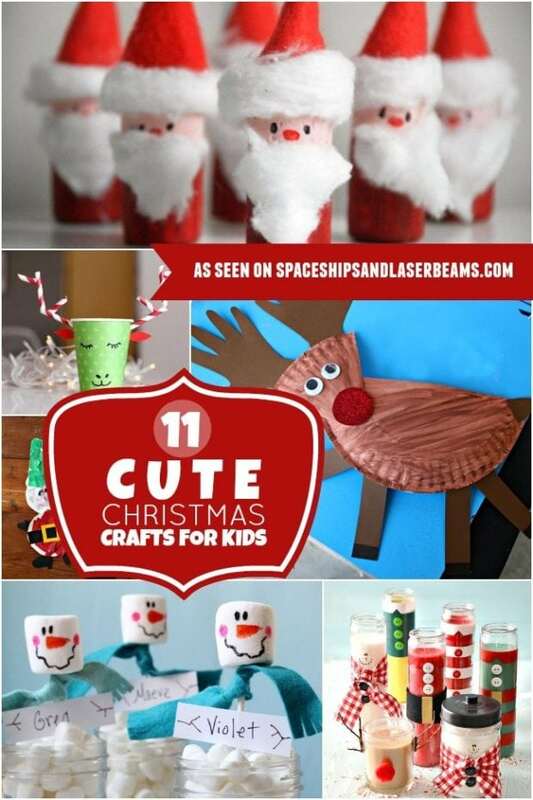 Don’t miss 13 Christmas Crafts for Kids.